I was still playing with my new owl stencil when I made this page. Even though I used the same stencil as yesterday, this owl looks really different. 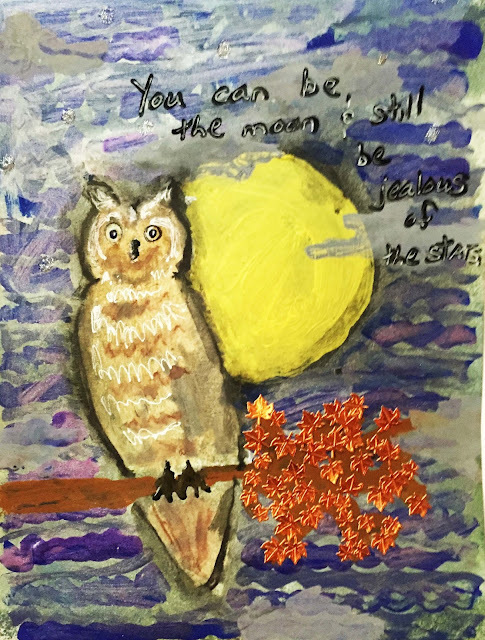 Besides the fact the owl is painted with different colors and outlined with a water soluble crayon, the painted background gives this piece a totally different feel. I painted squiggly stripes in 2 shades of blue and then covered them with a light coat of silver (which got a little thick in the top left corner), and except for that smudgy area I like that effect. Its one to remember for some other page. What you can't see in the photo is the little glittery stars I added, which is too bad because they do give a little more sparkle to the page. I'm not sure I put the quote in the best place or wrote it out the best way possible, but I used some copper colored foil paper I had and cut the leaves on the branch, and I really like those. So I learned a lot and still got a good journal page too. So I am linking up to Art Journal Journey where this month's theme is Indian Summer-Golden October-Autumn. Thank you Valerie for hosting. And I am going to also post to Try It On Tuesday. The theme until next week is Sun, Moon and Stars. But otherwise, not much else is new with me. this page is fascinating, I love owls. I like very, very good. A nice day for you. Yes it is a completely different look to the owl you showed us yesterday! The quote is so interesting as well - never heard it. I love all the tiny leaves on the branch! You get an extra hug for making that pages for AJJ and TIOT - great combining of both themes! Hope for you that your long weekend appears soon! I missed T Tuesday entirely this week :( but am enjoying the looks you are getting from your owl stencil. It surprises me that the owl can look so different using the single stencil. This is charming! I love how it all came together, the texture in the owl's feathers and the whole look. Enjoy your long weekend! Sounds fun. And still sending good wishes your way in hopes that your husband's surgery will be soon and successful. I was here hours ago, then got distracted by a neighbor who wanted to sit and chat. Now I'm back, hours later, and loving that owl. You will get a lot of mileage out of that stencil, I can tell. It's a great two-fer with both AJJ and TioT. I'm really impressed. Another fantastic owl, its a great journal page and I do like the words you added. Thank you for joining us at TioT's Erika. A great page, Erika! Love the owl, it has a fun expression, and those autumn leaves look fantastic.